How healthy is your liver? Sitting just to the right of the stomach, your liver is the body’s largest gland used for detoxification. It is responsible for purifying blood and creating bile, which helps your body to digest fats. Without a properly functioning liver, you can become over-encumbered with toxins and pesticide residues that cannot find an exit, only to recirculate into your blood. The liver is also responsible for breaking down alcohol, drugs (including antibiotics and pharmaceutical meds), and hormones, as well as converting stored sugar into glucose. It also stores some vitamins and iron for the body’s use. You might say that the liver has a very important job. Because it is responsible for so much, it can be prone to disease. 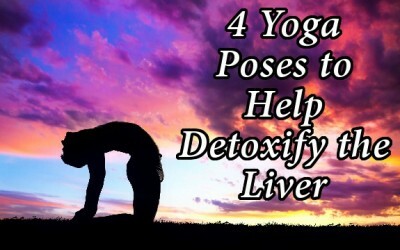 But in addition to indulging in a liver cleanse diet, there are several yoga practices that help to unclog and detoxify the liver, helping it to function at its best. The internal organs are made of muscle tissue, too, and just like the muscles we get massaged – sore arms, shoulders, back, legs, etc. – the liver, along with other internal organs, could use a little help with blood flow and releasing tension as well. Not only does this posture help to calm the brain and nervous system since your head receives a plethora of blood flow, it also stretches the hamstrings and relieves lower back pain. It aids with digestive ailments, and can improve prostate function, too. The best part, though, is that because the body is essentially folded over itself, the liver gets a little massage, which helps to get old, stagnant blood moving through its musculature. The spleen and kidneys receive the same benefit. Simply stand with feet hip’s distance apart, and bend from the hinge of the hips forward, allowing your fingers to curl around your toes and the head to dangle in gentle traction. You can also practice this one lying down, in which case it is called Supta Padangusthasana, and practiced one leg at a time. The standing posture will aid the liver, more; however. Due to the axial rotation of the spine, not only are the glutes and spine stretched, but again, the internal organs are massaged, and the liver is purified and vitalized. This posture stretches the whole length of the spine, and if done correctly, also stretches the transverse and rectus abdominis (which help to hold your liver and other organs in place) all the way up to your neck muscles. It can be practiced with the belly face down on the floor. Simply place your hands on either side of your chest and begin to press the heart up and away from the floor, keeping the shoulders down away from the ears. You can press up part way and rest on your forearms, which is called ‘easy-hand’ cobra, or press all the way up until your arms are straight. The stretching of the abdominal wall also transfers to the liver, and helps increase blood flow to this area of the body. These include headstands, shoulderstands, handstands, wide-legged forward folds, etc. One of the primary ways the body also detoxes itself is through lymph flow. This system relies entirely on musculature movement, or turning the body, literally ‘on its head’ to reverse the flow of lymph and help the body rid itself of impurities accumulated in different organs – including the liver. These yoga postures also send blood flow to the ‘master’ gland, the pituitary, which regulates the entire endocrine system. When the lymph is moved through the body via an inversion, the lymphocytes can attack foreign bacteria and viruses, and the liver is freed up to work on things like heavy metals, pesticides, and other toxins. When both the lymph system and the liver are cleansed in tandem, the body enjoys greater health and less risk of disease.